Go to any sport arena in the world, and chances are when umpires debate who's got what dibs on the staffroom cookies or as a score is tried and everyone returns to their restart positions, the DJ of the arena will play something by Brit rockers Queen. Stadium anthem We Will Rock You is always popular, along with We Are The Champions and Another One Bites The Dust. But you know what little ditty used to get me amped up most more? The intro tune to the X-Men cartoon of the 90's. Sure, I doubt it's never being played to large crowds, but it sure should be. Especially now, a genius modestly going by the name of Kyle Roberts has recreated said cassic opening in stop-motion, action figure awesomeness. Who says Christmas never comes early? Eat your heart out Eye Of The Tiger. 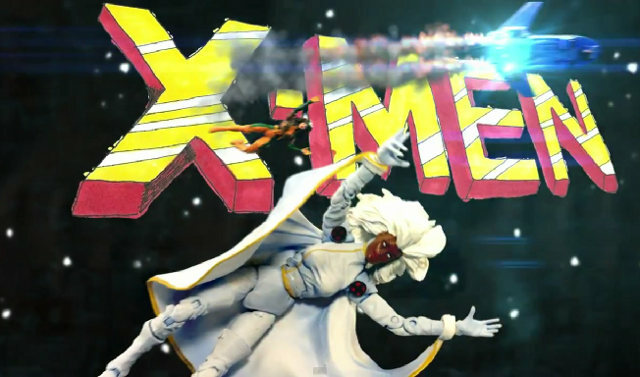 See that shot of the X-Men running towards their enemies as the beat climaxed? Killer, killer stuff. pretty cool! this is a nice homage to the last descent cartoon that Marvel did. everything else since then has been rubbish. i dunno DC just has had that market cornered especially now with Young Justice. For me Marvel and DC have the same issue - how many Batman and Spider-Man cartoon series do we need? Maybe the reason so many people overlook comics, is from the outside it seems to be a stable with only four horses in it. One cartoon I would like to see revisited though - Silver Surfer. I think that series and Marvel Cosmic has quite a lot of legs. Sure the Guardians will probably get one post the movie, but only Surfer really carries that Marvel level sense of guilt. well i'm not really a X-Mass guy if you know what i mean but i appreciate the sentiment. Dan, i'm about to post the coolest Rom reference ever from a Peter David HULK back issue. you're gonna think this is so cool. I truly grew up blessed to come up during an new golden age of comic-based cartoons in the early 90's. And there two kings of that genre at the time; Batman was one, and X-Men the was the other. Loved both. My son was watching this the night before you posted it up. He found it on Youtube. I could hear the theme song from the kitchen and it was killing me. I knew it but couldn't place it. It's been a few years since I've seen the show. Man, that was done so right. Nice find Dan. Glad you loved it Dale - thought it might be right up your alley. Mystique vs Nightcrawler in the opening? I didn't recall that in the original, but maybe Kurt was originally the role Morph took in the opening episodes? Hope not, Kurts one of the best and I would've been screaming til season end if they had cut him that early! Craig - OA glad you guys dug it too. Craig, if you're son wants to be a post topic scout, there's a used copy of Action Comics in it for him!